I bet it happens to all of us that after making something like a praline meringue cake, we feel a bit wasteful for binning all the leftover egg yolks. 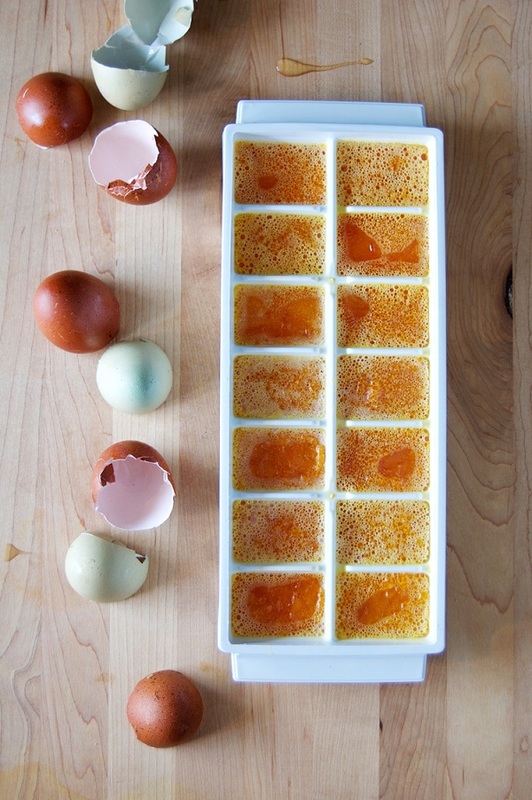 In the past two weeks, after making those bad boys twice, I thought there must be a way to save those poor yolks...and after a bit of research, I found this genius trick. And it's dead easy too: just whisk them all together, pour them into an ice cube tray and freeze them for future cakes, lemon bars, scrumptious quiches or homemade mayonnaise. P.S: You can also do this with whites or both. P.P.S: How to make the perfect fried egg. How do you know how much to put in if its mixed and then poured? Do you let defrost and then weigh?